MetaTrader 4 or MT4 trading platform has long been considered the industry standard for Forex traders around the globe. GO Markets is widely recognised as the broker who brought MT4 into Australia back in 2006. Our history and experience with the platform is second to none and our range of MT4 tools, such as MT4 Genesis, have been brought on to better serve our growing client base. 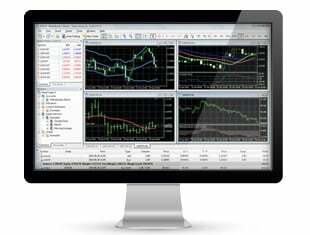 Our MetaTrader 4 Mac and Windows software is a popular choice for novice and expert traders alike. MT4 was traditionally built for the Windows PC, but we’ve since added the ability for Mac users to access the same advantages as their PC counterparts. GO Markets offer a MetaTrader 4 Mac download that allows Apple users to experience the same fast and reliable trading experience. When you download MetaTrader 4 demo account for Mac, you’ll have access to all the same features as a standard PC, and no additional software or add-ons are needed to get your account started. Download our MetraTrader 4 Mac version today to start your trading journey. Technology continues to improve, and when it comes to mobile trading, our MT4 mobile solutions allow you absolute freedom to trade anywhere, at anytime with a range of mobile trading apps. With GO Markets, it’s easy to unlock knowledge about MetaTrader 4 and its abilities. Breaking down the features, tools and workings of the platform, our tutorials help beginners learn more about MT4 software. For those getting started with MT4, we have a few tools to help you navigate around the platform with ease, including video and written tutorials. Focused on your trading experience, GO Markets provides you with a range of different educational tools while also offering round-the-clock support.